"At Henley is the chief regatta-course on the Thames, which here widens into a broad straight reach of water, eminently well adapted for boat-racing. 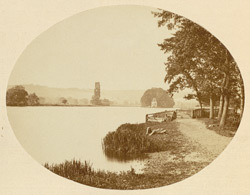 the first rowing match at Henley took place in 1829, between two University crews, and ten years later the Henley-on-Thames Royal Regatta was established...The length of the course, from Regatta Island to the bridge, is 1 mile 3 furlongs...At the head of an islet, thickly planted with tall handsome trees, stands conspicuously a pretty white temple of Grecian design, the summer-house belonging to Fawley Court, Bucks, on the neighbouring bank. This islet, having been made the starting-point for the racing boats, has now come to be known s Regatta Island. The present mansion of Fawley Court, the seat of Edward Mackenzie, Esq., erected by Wren in 1684, succeeded the old Manor House of Sir Bulstrode Whitelocke, an early opponent of the despotism of Charles I."